ROBOT RACING! 2-3 Players! Kid Friendly! Super Quick! So, let me tell you the story of Robot Dash. When I was starting the wrap up of one of my other games, Small Town Secrets, it occurred to me that one of the primary playtesters, Ben, would probably not be able to play the game with his kids. That hardly seemed fair, so I started brainstorming with the idea that most kids like robots. I also was fascinated by the thought of a puzzle I had played with decades ago in a magazine: it required you to make your way through a maze that had doors and keys, but you could only hold one key at a time. In hindsight, puzzles like that one absolutely had the same kind of feel that the early Metroid games did, and I think that's why it really stuck with me. Anyway, as I'm toying with the two notions, the proof copy of Small Town Secrets arrived, and I showed it to my parents. My dad, who has decades of experience in running casinos, jokingly remarked that the deck wasn't divisible by 54 -- the size of a standard playing card deck with jokers. 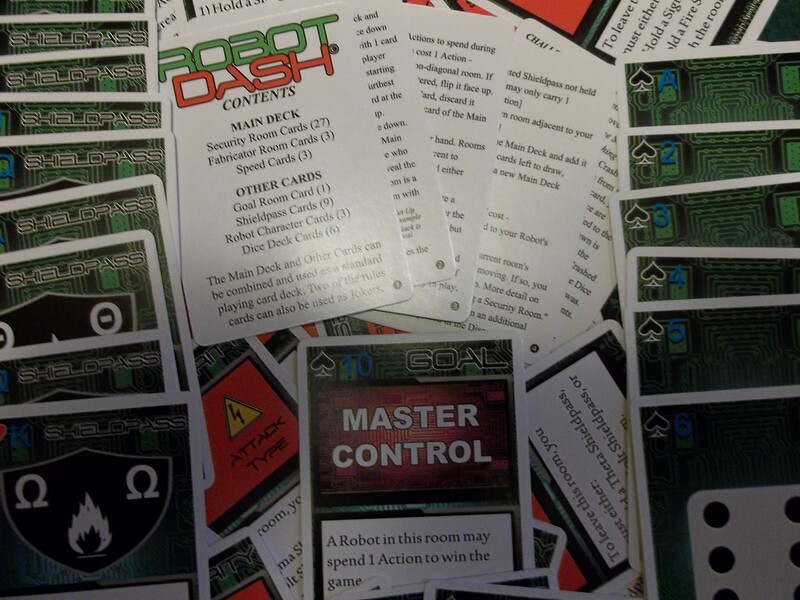 That's when it hit me: the robot game could serve double duty, both as itself and as a standard deck of playing cards. As I got to the point where I had things polished and was ready to start playtesting, another thought hit me: If I could playtest with a standard deck of cards, why not write up a free version for those who can't afford it, or just want to get a feel for the game. It's kind of like the choice between Uno or Crazy Eights. At their core, they are the same game, but Uno is prettier and has more options. With Robot Dash, it's the same exact game. The printed cards make the game easier to grasp, since they have rules right on them, but each card has a one-to-one counterpart. So, why should you buy the game? You may want to buy the print version so you have quicker card recognition and set up, or just to have an interesting set of playing cards. Or just as a way of saying thanks for the game, if you have fun with the free version. Where can you get the free version rules? The free version will be posted here as the "rulebook." If you download the rules and have fun, it'd be cool if you let me know somehow (facebook, email, smoke signal) or spread the word about the game with people who might like it, but no worries. If anything seems unclear, also feel free to drop a note. I have not yet, but am reading through the instructions on how to do so -- which were written by you, if my guess is correct -- and will attempt to do so! The guide seems both clear and comprehensive, so I don't foresee any problems, but I'll let you know if I run into any snags. Thank you so much! Just curious- have you put this or your other games up on Board Game Geek? This title was added to our catalog on April 09, 2015.